Oria held the barrier against her raging brother. At least, she did the best she could with her magic draining by the moment, its potency attenuating with distance and diminishing with the lack of opportunity to replenish her sgath—or to even take a full breath. Of course, her upside-down position, bouncing over Lonen’s shoulder as he ran headlong through the palace, did nothing to make any of it easier. “We may be in luck,” Chuffta, her Familiar, reported. “Yar’s magic is running low also. He’s sent for more priestesses to feed him sgath, as Gallia can’t.” He paused to mentally cough at that. Oria’s Familiar had also telepathically received Gallia’s urgent message for them to run. As Yar’s wife—particularly a newlywed in a temple-blessed marriage—only Gallia should be feeding Yar sgath to fight the magical barrier Oria had erected to save herself from execution, and Lonen from retribution. But Gallia had only recently arrived in Bára and, unused to the city’s native magic, so different from her home at Lousá, she had not reached her full power. But Gallia was stronger than she’d claimed. As a sister in magic, Oria could judge quite precisely how much Gallia had been capable of channeling. Oria’s new sister had exaggerated her weakness—in a move shockingly disloyal to her new husband and against all expectation—to allow Oria to escape. If all went well, Yar would never discover the deception. Between his unstable temper and Gallia’s status in Bára, that could turn out badly for her sister sorceress. Hopefully, she’d take Oria’s advice and appeal to her and Yar’s mother, the former Queen Rhianna, for assistance. “I can’t imagine Priest Vico will allow other priestesses to feed sgath to Yar. It’s against temple law if his ideal wife is alive and well,” she replied to Chuffta. She framed a reply—speaking mentally took concentration—then grunted in pain as Lonen ducked around a corner, the sudden shift in direction making his shoulder dig into her belly. It looked so much more romantic in the illustrations. In reality, being carried off over a barbarian’s shoulder left much to be desired. She didn’t reply. Couldn’t. It would be handy if she and Lonen could speak mind-to-mind the way she could with Chuffta—and unexpectedly with Gallia—particularly under circumstances like this. He might not like it, though. At the moment, all of his considerable personal energy was focused away from her, no doubt on fighting them free of Bára. At least that saved her having to screen out his emotions along with everyone else’s. “You are correct,” Chuffta reported from his vantage, flying well above Yar’s group. Her Familiar seemed to be enjoying his spy activities. “They are arguing about it. Yar is most put out. He’s losing focus and less able to fight your barrier. 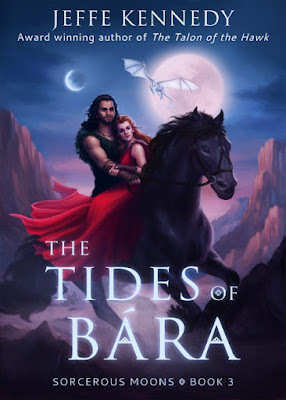 Vico is gently suggesting he check his hwil, which has not gone over well.” No, Yar would not do well with the suggestion that he might be showing any loss of the crucial equanimity that allowed the priests and priestesses of Bára to handle their dangerously powerful magic. Loss of hwil could be grounds for the temple taking back the mask that was their badge of office. With no mask, Yar could not be king. Could she somehow use that to her advantage—push Yar into losing hwil entirely? It might be, though. If only to save Bára and Dru both from the devastation that would be Yar’s rule. “I won’t let you sacrifice yourself. Neither will Lonen,” Chuffta added. “I’m already regretting that I encouraged you two to become friends,” she grumbled.